Our wonderful volunteer, Micky Fukasawa! Volunteers continue to play an integral part in International House’s success, and one volunteer in particular has stood out over the years, Micky Fukasawa. 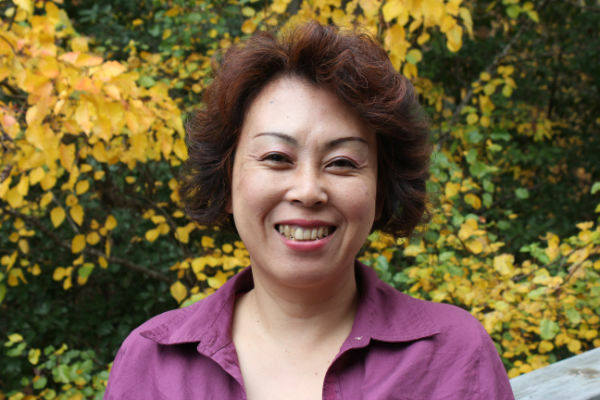 Micky has been volunteering at International House for almost ten years; she started soon after moving from Japan to the United States in 2003. She has taught both English and Japanese in Japan and worked at a travel agency for six years, while visiting thirty-one countries around the world. Additionally, she was a coordinator at the International Internship Program. She considers International House the perfect place for her interests and has done numerous tasks for our organization. Currently, she volunteers every Friday at International House and attends Queens College, while giving piano lessons at home. Read our inspiring interview with Micky, below! My name is Micky Fukasawa. I am from Japan, but have lived in Charlotte for ten years. I came to the United States because of my husband’s job. I have a daughter and a son. I have no other family or relatives in the United States. When I first came to Charlotte, I wanted to get closer to the community, find my niche and make friends who share the same interests as mine. International House is the perfect place to know about the community for a newcomer and to meet people from all over the world. Tell us about your work with International House. I have worked in the administration department regularly, while also giving many singing performances at events such as at the Volunteer Appreciation Night, the Gala, and the Language Conversation Hour Party. Additionally, I was a lecturer at A Taste of Tea and Zen ceremony and a presenter at several events such as the ImaginOn Bilingual Storytime, Kids Health Link, and Children’s World of Play. Furthermore, I have been part of the organizing staff of several events that International House participated in, such as the Dragon Boat Festival, UNCC International Festival, International Fashion Week, and the Bastille Day Festival. What do you like about volunteering for International House? I keep trying to assimilate to the American life. On the other hand, when I come to International House, I feel comfortable with being an immigrant because people there are open to unfamiliar cultures and can empathize with someone from another culture. International House is a safe environment to me. I feel good knowing that my volunteer work is valued. I am glad to help International House’s mission to move forward. What is the most important thing you’ve learned while volunteering at International House? I am not the only one who has struggled with blending in a different social life here in the United States. One might feel intimidated, embarrassed, resentful or confused in their daily life, but they keep moving forward. This type of thinking empowers me and makes me stronger. Micky continues to be an instrumental part of International House’s success, and we thank her for everything she has done and continues to do for us!